For the third time in days, Apple's Phil Schiller has reached out to a developer who has had issues with the iPhone App Store, while the latest build of Snow Leopard could reveal the operating system's disc art. Schiller, the company's senior vice president of Worldwide Product Marketing, is said to have sent an e-mail to company theory11.com LLC about a "rising card" trick application rejected from the App Store, a story by Dow Jones Newswires said Thursday. Days ago, the Apple executive sent an e-mail to Steven Frank, co-founder of Panic after the Mac developer said he might boycott his iPhone. Prior to that, Schiller contacted John Gruber of Daring Fireball after he criticized the App Store —a move that, at the time, was unprecedented for a executive from a notoriously tight-lipped company. But now it would appear that Apple is considering taking a different approach. It should be noted that Ben Charny, the author of the report, is the same reporter who incorrectly stated that Apple would be attending CES 2010 for the Wall Street Journal. Digging around the latest —and rumored to be Golden Master —build of Apple's upcoming operating system, GearLive has discovered what appears to be a change in disc art for the Mac OS X DVD. The image was found in the OS install icon which, in the past, has been consistent with the disc art. 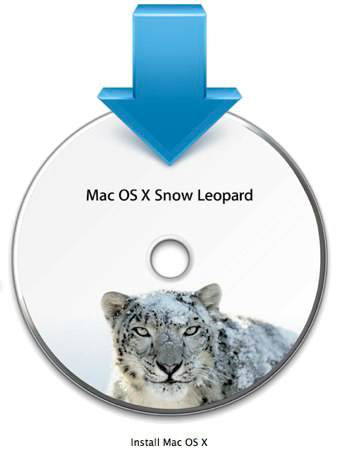 The previously shown design had a large X with a purple outer space-like background, while the new style abandons it for a clean, white background with a picture of a snow leopard. This week, Mac OS X 10.6 build 10A432 was seeded to the developer community. Reports suggest it is the final build of the operating system and could be for sale in a matter of weeks.